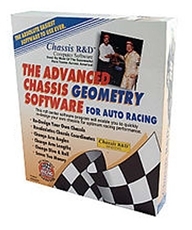 This revolutionary, patented software program will set your race car up for the maximum performance and make all four tires work. This program is absolutely the best and easiest to use. Used by winning race teams across America. This software enables your team to find correct spring rates, sway bar diameter, Big Bar / Soft Spring Set-up and panard bar height. It increases your opportunity for winning immediately. Eliminates endless hours of trial and error and saves you money.